Bishop Alan’s Blog: Speak up, speak clear, say it now! Speak up, speak clear, say it now! Bishop Nick Baines reminds me it’s the 25th anniversary of Pastor Martin Neimoller’s death — “they came for the communists, I didn’t speak up because I wasn’t a communist...” It’s a chilling reminder that, given the choice, we speak up against racism and anti-Semitism too early, not too late. h/t John Hobbins: Text of monologue/poem here. 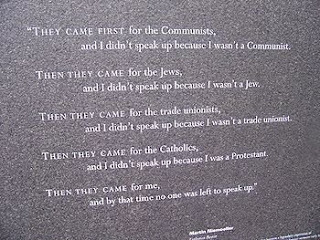 Who will speak up for Jews? ‘For you, brothers, became imitators of God’s churches in Judea, which are in Christ Jesus: You suffered from your own countrymen the same things those churches suffered from the Jews, who killed the Lord Jesus and the prophets and also drove us out. They displease God and are hostile to all men in their effort to keep us from speaking to the Gentiles so that they may be saved. In this way they always heap up their sins to the limit. The wrath of God has come upon them at last. I agree these words are easily misunderstood in dangerous and shameful ways. I suggest you read them as what they are in historical context. Obviously he is talking about particular people, and it would be anachronistic to read medieval anti-Semitism back into them, partly for the obvious reason that the writer is a Jew to the fingertips who called himself a “Hebrew of the Hebrews.” with a personal track record of hunting down Chritians. The whole use of the term "the Jews" in pre AD70 discourse is intensely problematic to discern; see the writings, e.g. E. P. Sanders esp Paul and Palestinian Judaism. Paul never calls himself a Jew. A Hebrew, or a Benjaminite, but never uses the J-word. Most commentators regard that rather shameful passage as a later addition. It is hard to see how Paul could have thought that God's wrath has come upon the Jews in the time period that he was writing. Did I misread that? Did you say: "It’s a chilling reminder that, given the choice, we speak up against racism and anti-Semitism too early, not too late."? Surely, we speak up too late? But what I really wanted to say is that this isn't true only of racism and anti-Semitism, but of every "ism", every institutionalied "they" vs "us", the "impure" vs the "pure". To see the individual always, the homogenous group rarely or never, is the greatest challenge. Steven, which commentator, please? I've just looked at 4 commentaries, and can't find anyone suggesting that I Thess is not Pauline. Who did you have in mind? Erika — Great to hear from you — hope all's well. Sorry not to express myself more clearly; what I meant was that if we are wondering whether to say something or not, if in doubt, speak up earlier not later. It was a reacion to Niemoller's saying. I'm sure it is true of every "ism" as you suggest. Even if nothing abusive is going on, the raising of the possibility helps to exclude it. I've met people who say "I'm not racist, but..." and then express a racist viewpoint in a kind of Alan Paretridge "It's not racist because I say it's not racist" way. Not all of 1 Thess. I was referring purely to 1 Thess 2, the verses I quoted. Paul claims in Romans 11 that all Israel will be saved, so it is hard to believe that he also wrote that God's wrath has fallen on the Jews, the people who had killed the prophets. Steven, I've checked again and not only is the section you mention spot on for Pauline style and vocab, but, of course what it says is very close to the arguemnt of early Romans on Wrath against all, which is pretty much rock solid Pauline. Which commentary did you read suggesting otheriwse, and on what grounds? I'm intrigued. Pauline style? That God's wrath had fallen on the Jews? Didn't Paul know that it was the Romans who had killed Jesus, not the Jews? Where else does he say that the Jews killed the prophets? Was Paul right to say that the Jews had killed the prophets? What Commentary told you this section was not Pauline? Just the one right now using my poetry as a tool, to follow KRS-One I will only uplift! And maybe change just one heart tonight. Powerful poetry, powerful cause. Hats off to Martin Niemoller. who in later life rejected his earlier conservative nationalism and campaigned for international peace, and to Vanessa Hidary, who is an ambassador of peace and respect. I'm trying to comment on your "Young Victoria" post, but can't because when I try to view that post on its own I get a blank page. There's obviously something wrong with its formatting. Powerful stuff, Tony, many thanks for your comment. Peter I'll look into it as best I can. So sorry about your prob... see what i can do (sometimes Blogger is a bit clunky and republising solves the problem). I'll try leaving a comment and see what happens. Peter, I've done a resubmit on the piece, and posted a comment successfully on it. Seems to be working now, but let me know if probs continue and I'll.. scratch my head and look lost! Or try again. Or something. I think the author of Dry Bones Dance has something apposite to say to this; although Niemoller wasn't female, he did learn that obedience wasn't all it was cracked up to be, after all. One of her commenters points out John 16:2, about the links between sheer murderousness and religious identity, as well: all relevant to identifying when and where to speak out.